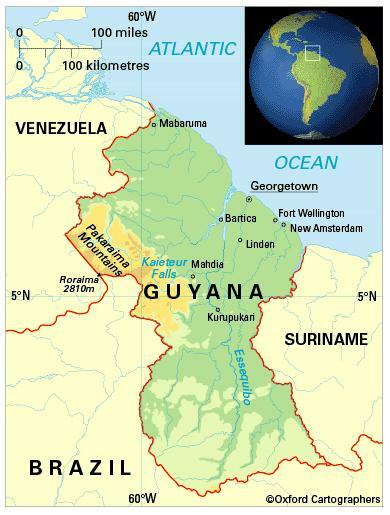 The Co-operative Republic of Guyana lies in the north-east of South America, north of the equator. It is bordered by Suriname, Brazil and Venezuela and, to the north and east, extends to the North Atlantic Ocean. The country comprises ten regions. Guyana has a warm tropical climate with high rainfall and humidity. The rainy seasons are November-January and May-July with an average rainfall of 2,350 mm p.a. in the coastal region. Inland rainfall averages 1,520 mm p.a. North-east trade winds moderate coastal temperatures. The most significant environmental issues are water pollution by sewage, and agricultural and industrial chemicals; and deforestation. 795,000 (2012); population distribution is very uneven, with a high concentration of people along the coastal strip and many inland areas virtually uninhabited. A quarter (28 per cent) of people live in urban areas. The population growth rate stood at 0.4 per cent p.a. between the years of 1990 and 2012, depressed over this period by emigration. In 2012 the birth rate was 21 per 1,000 people (38 in 1970) and life expectancy was 66 years (60 in 1970). The ethnic origins of the people are: 44 per cent Indian (resident mostly in agricultural areas); 30 per cent African (mostly in towns); 17 per cent of mixed descent; and nine per cent Amerindian (mainly in the west and south, or on reserves). Data from 2002 census. Guyana is classified as a lower-middle-income economy by the World Bank.